Dedmon’s journeyman career had been on an upward path the past couple of seasons but appears to have plateaued under new coach Lloyd Pierce. Dedmon was coming off the bench before missing a few games for personal reasons after starting 46 games last season under Mike Budenholzer. His playing time has taken a hit from 24.9 MPG to 19.7. Dedmon is making $7.2MM but will likely have to settle for a veteran’s minimum deal or something close to it in unrestricted free agency next summer. 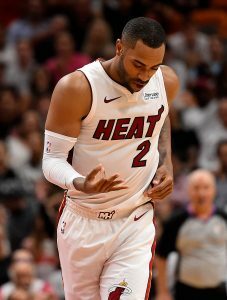 The Heat have an overload of options at the wing positions but Ellington’s shooting has made him a steady rotation presence since recovering from an ankle injury. Over the past five games, Ellington is shooting 44.7% on his 3-point attempts. That’s the main reason coach Erik Spoestra has played him an average of 28.6 MPG over that span. Ellington settled for a one-year contract in free agency this summer and his outside shooting should lead to multi-year offers in July. Lamb averaged double digits in scoring for the first time in his career last season and he’s established himself as a starter this season. Lamb is averaging 12.9 PPG as Kemba Walker‘s backcourt partner while shooting a career-best 39.2% from long range. He’s also been a factor on defense (career high 1.4 SPG). Lamb is making $7.49MM and his shooting and defensive length will grant him a healthy raise when he hits the open market in July. Ross appeared in only 24 games last season due to a knee injury. He started most of the games he was able to play for Orlando after being dealt by the Raptors in February 2017 but new coach Steve Clifford has made him a second-unit contributor. Thus far, Ross has thrived in that role, averaging 13.9 PPG while making a career-high 39.3% of his threes. That kind of production will give him consideration for the Sixth Man award if he keeps it up. It would also lead to multi-year offers next summer for Ross, who is making $10.5MM. The Wizards have finally shown some signs of life, winning their last three games, but Oubre has been heading in the opposite direction. He’s scored in single digits in five of the last six games. He’s also been in a prolonged shooting slump, making 14% of his 3-point tries over the last nine games. The capped-out Wizards must extend a $4,485,665 qualifying offer to Oubre next June to make him a restricted free agent. If he has a down year, the Wizards’ decision will become even tougher.